FAQ on 826NYC, including why it has a retail storefront. 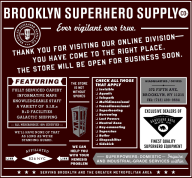 The sign for the Brooklyn Superhero Supply Company reads, in no-nonsense block print: "Ask inside! We can custom-order alter egos." Promising capes, masks and shrinking gas, the sign adds, "If we don't have it, a superhero doesn't need it." Further curiosities lie within. In the rear, past floor-to-ceiling shelves bearing grappling hooks and utility belts, a secret door masked by a steel bookshelf swings open to reveal - shazam - a tutoring center. The original San Francisco version, 826 Valencia, has a pirate storefront. Kinda slow, but I liked it.